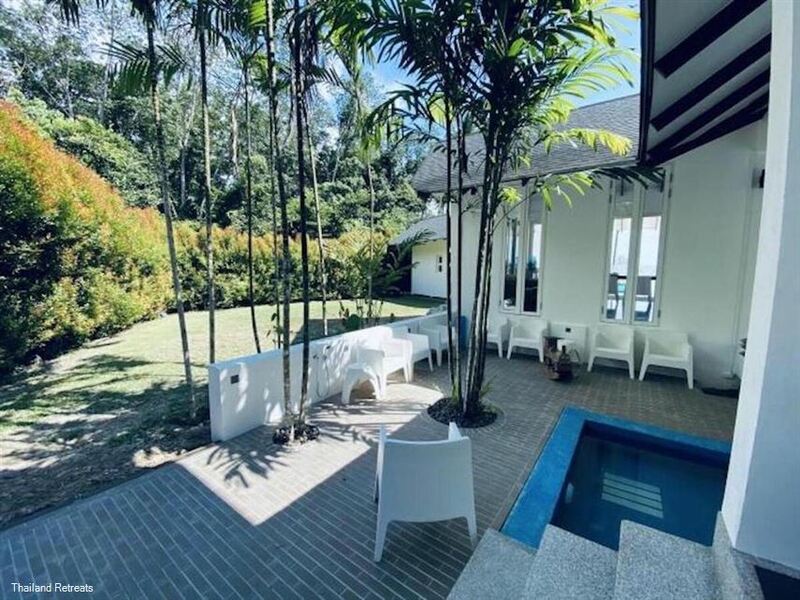 Krabi Beach House with it's private swimming pool is located close to the town of Ao Nang and a perfect holiday villa to stay in whilst exploring what amazing Krabi has to offer. This waterfront villa is ideal for family gatherings or to chill out with friends. 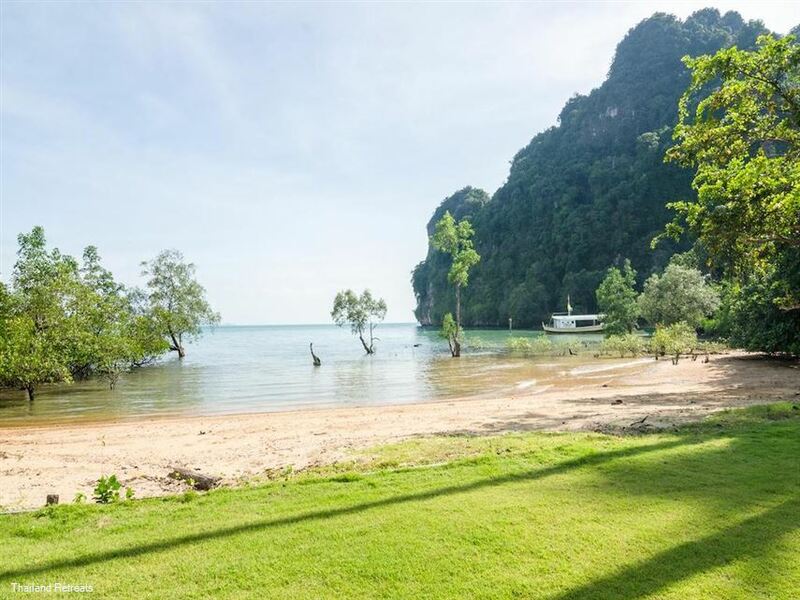 A sandy beach is at the end of the lawned garden and complimentary kayaks are available for guest use to explore the surrounding coves and islands..
Krabi Beach House is a spectacular property. Sitting directly beside a private beach and enjoying panoramic sea views across the sparkling Andaman Sea, the villa is in the perfect location for a relaxing getaway. 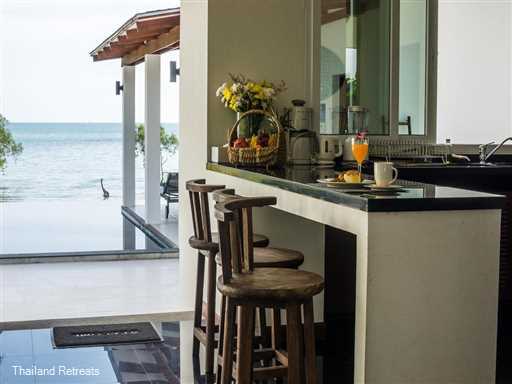 With its striking, contemporary architecture and outstanding, stylish interior, The Beach House is sure to delight its guests. 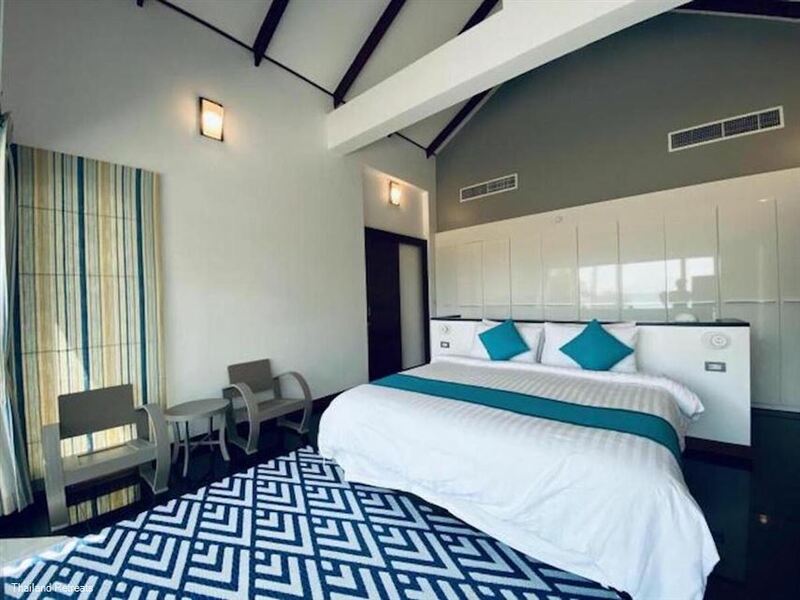 The sleeping accommodation is equally impressive and all four bedrooms benefit from air-conditioning and have their own stylish en-suite bathrooms. 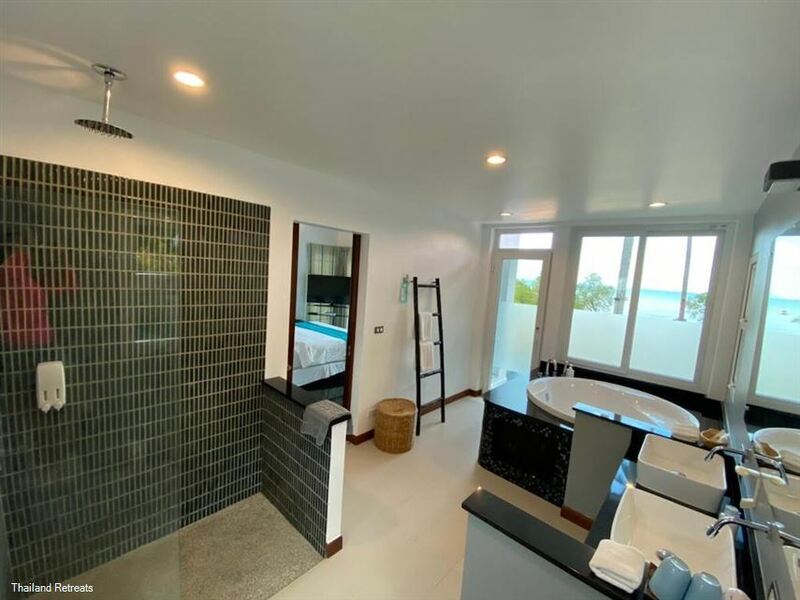 The skilful design of the property has resulted in a master suite that enjoys stunning sea views and direct access to the impressive swimming pool. The room’s high pitched ceiling creates an air of spaciousness, and the sumptuous en-suite bathroom has a circular Jacuzzi tub. 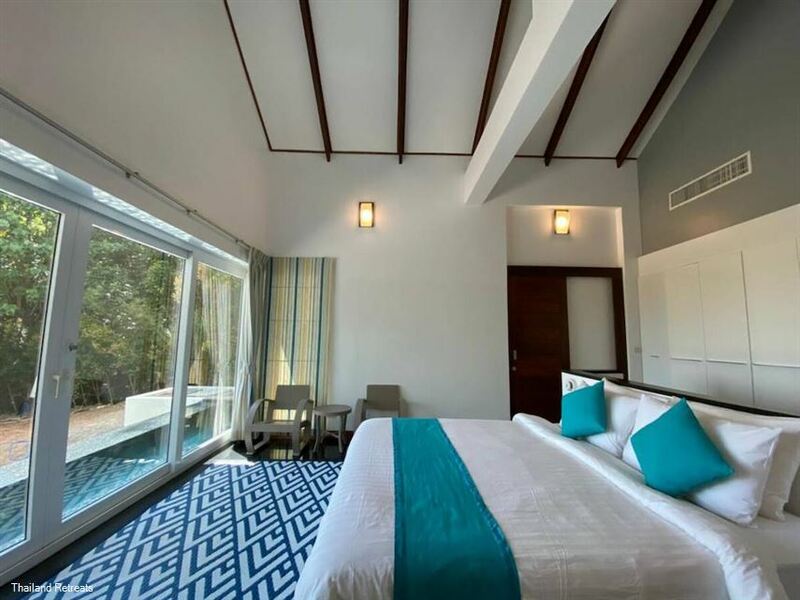 What’s more, this room benefits from a dressing area and a king-size bed. The second bedroom also has a king-size bed, dressing area and a sea view. The remaining two bedrooms are located on the other side of the property, although these rooms still enjoy pleasant views due to the villas scenic location. Bedroom number three is situated on the first floor and has a king-size bed and a dressing area. 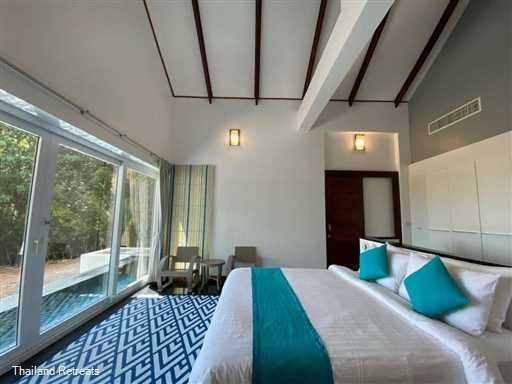 This room also has a balcony that enables guests to enjoy mountain and sea views. 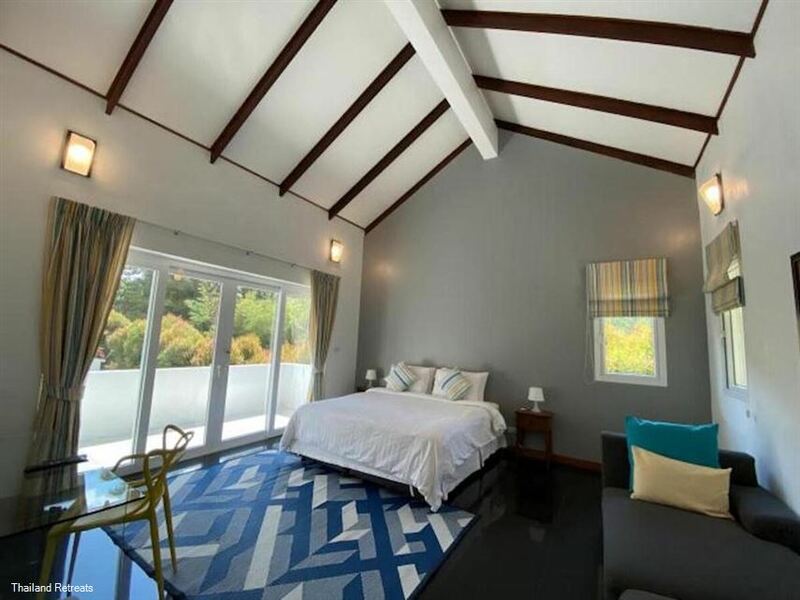 Bedroom number four has twin single beds, and this room benefits from a mountain view. Outside the property, there is a beautiful landscaped garden with a lush green lawn rolling down to the private sandy beach. 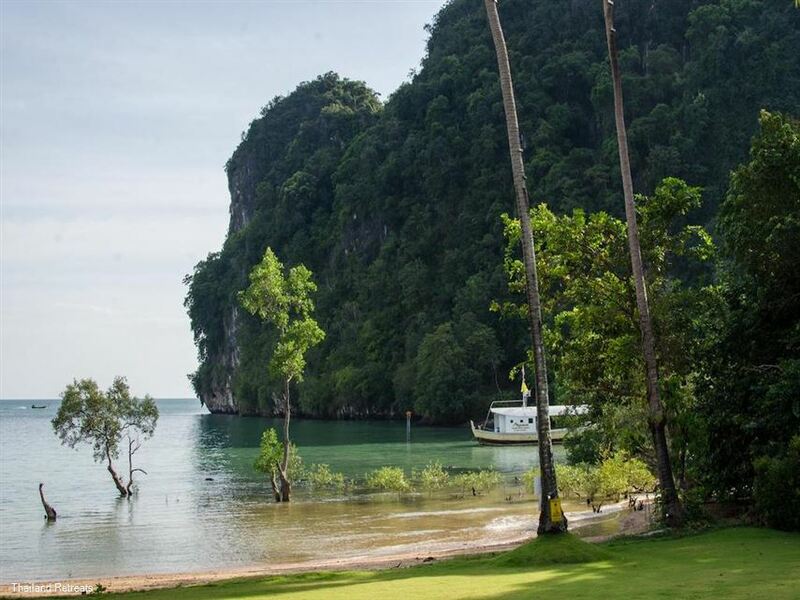 The garden is planted with tropical vegetation and fruit trees, and there are attractive views of the impressive limestone cliffs that surround the area. 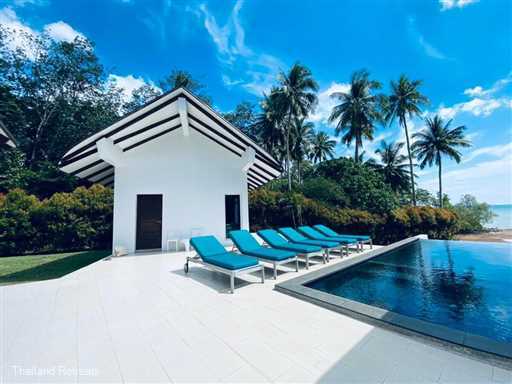 The villa’s infinity edge swimming pool is an exciting feature, and the patio area bordering the pool is conveniently furnished with sun loungers. 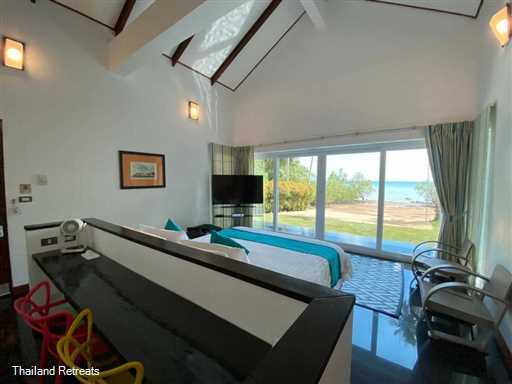 Despite the villa’s beachfront location, there is convenient road access for those guests wishing to explore the area and a hire car can easily be arranged. 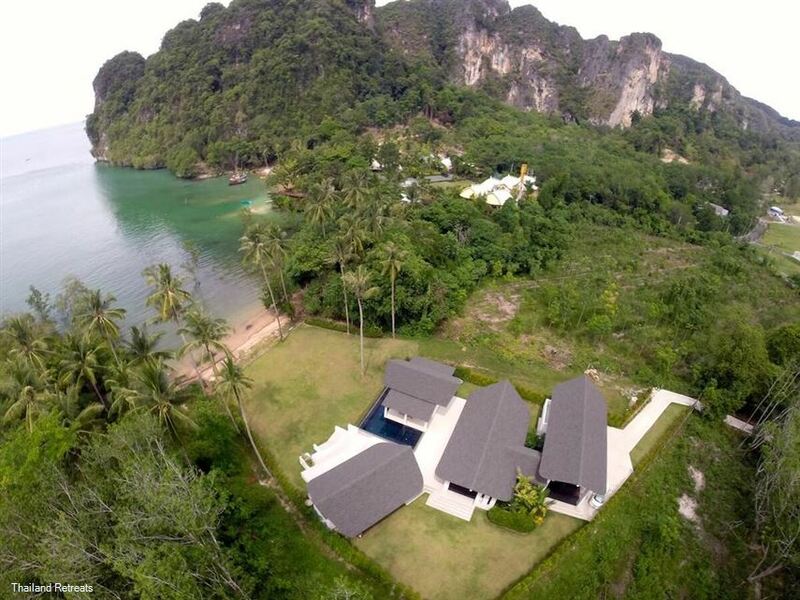 Guests staying at The Beach House can also use the villa’s two kayaks ( double and single) to paddle along the picturesque coast for which Krabi is so well-known. 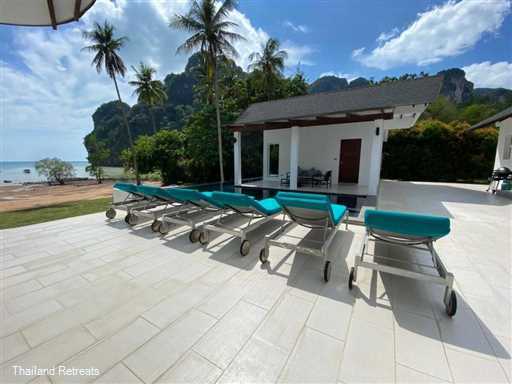 We were a group of 6 people and Krabi Beach House Villa was perfect for us. The location is excellent. 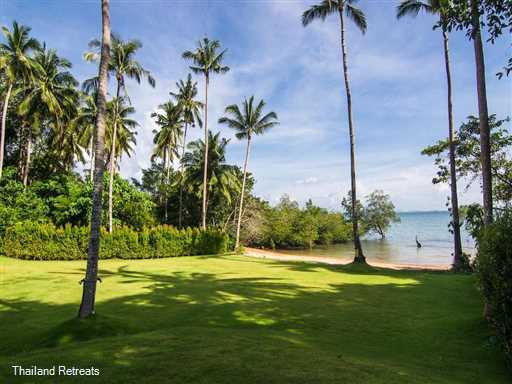 Not far away from the main beach and you can enjoy the peace and quiet. We had our own private beach and a lovely lawn and infinity pool. Two of our Villa's had an amazing view of the lawn overlooking the sea. We were given a Tuk-Tuk which was available to us free from morning 9AM to 10PM. We could go anywhere to the main market area and the beach. All 4 days we had breakfast and dinner at the Villa since we had asked for the cook to come and prepare food for us to our liking. The food was great. We loved the spicy Thai food cooked for us. We had a great time at the Villa. It was a perfect relaxing holiday for us. We stayed as a group of 7 friends in krabi beach house for a week and it was the best villa experience I have ever had. The place is better than in the pictures and kayaking right from our own beach was a particular highlight of mine. Everything that was promised on the advert was delivered and even when one of the motorbikes broke they rented another one in! Sara, our villa manager was extremely helpful and easy to reach, helping us to organise tours etc and even accompanying us! We had the most wonderful holiday. The service was impeccable, the location and amenities were second to none. We have travelled to many varied locations around the globe as a young family. On this occasion we travelled with another family with whom we are good friends. It was the best holiday we could dream of. We were left in piece and quiet but were only a phone call away from the Krabi Riviera team, who sorted us out within moments with anything we asked of them, they looked after us beautifully and always with a smile. 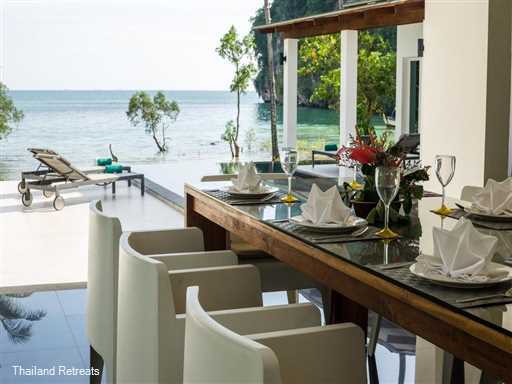 We loved everything about the Krabi Beach house and will definitely be return guests in the future. Fantastic stay, the team that look after the Villa are amazing. 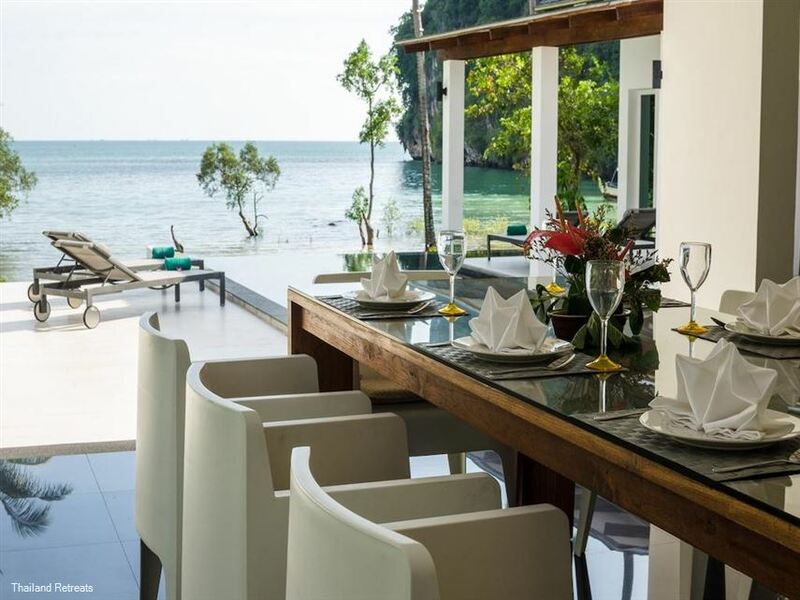 Ching is a superb manager that is able to arrange for Chefs, Massage and even Private Speed boats. Chai is the driver and very funny, he is the "Cool Dude" and will pick you up from anywhere within 10 minutes (just enough time to finish your cold drink). The villa is the best place we have ever stayed, and we have stayed in a lot of places. Full Stop. Please do not make this location too popular as we feel it is a home from home, and we are already planning our next visit. 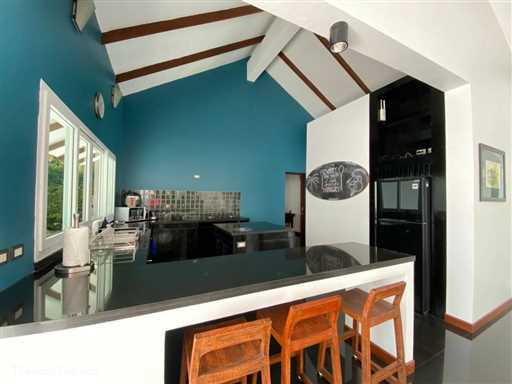 We love the living / dining area that has open concept. 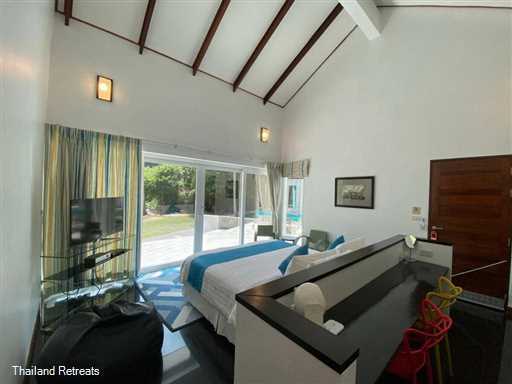 All the rooms are spacious & simple yet important like hot water / water pressure are all in good condition! The rooms have wonderful views. The views are so good that almost everyone wakes up early to enjoy the sunrise & we use their big lawn facing the sea every morning for tai-chi & yoga! Their service is very good. They provide free use of their tuk-tuk service to town & 2 motorbikes as well. They also provide additional service of booking island hopping tours or other day tours. Only one thing, the small pathway for car/van to drive into property is very narrow & dark during night. Ching the co-ordinator for the Beach House rental is prompt in responding to all our queries prior to arrival, patiently helping us with the rental, transport, daily breakfast, restaurant recommendations and booking and massage arrangements. She even answered our call for assistance at 9pm on our first night. The Beach House itself has its own private beach, which we could kayak out from. The rooms are clean, big and each family had their own private space (there were 9 of us plus 3 kids) and a common area for our meals and gathering. The attention to detail in service is impeccable right down to offering us a mobile phone to use with her contact number and the driver's contact number stored on quick dial. 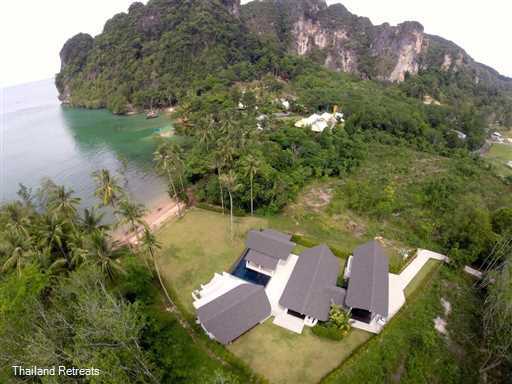 The driver response time is fast too for pick ups and drop offs between the Beach House and Ao Nang. Ching also kindly arranged transport for us to another resort from the airport. A great place to stay for a big family. Kudos to a GREAT team. A point to note, the stairs to the room on the second floor is not safe and the space in between the pillars outside the room door are too wide, which a child may potentially fall through. We kept an eagle eye on the kids and told them not to go upstairs without supervision. We booked the Beach House for our destination wedding. It seemed to meet all our criteria: secluded, modern, spacious, and easy to reach for guests from around the world. Throughout the wedding planning process, we found communication with the staff to be timely and helpful. Not only did they speak perfect English, but they grasped the vision we had for our wedding and were able to make excellent recommendations for all components of the event. It can be difficult to feel confident about wedding planning even when meeting with planners and service providers face-to-face, but Vishal and Ching made us feel comfortable from the other side of the world. They sent photos of flowers, banquet setups, cakes, and customized maps and menus for us. They consulted with us in great detail about every part of our event and stay. We arrived three days before the wedding and met with Vishal, Ching, and Sara at the villa. The moment we arrived, we knew we had made the right choice. The photos we had seen online did not do the villa justice; the space was breathtaking. Also, Vishal and Ching were naturals at event planning. They found a way to fulfill all our requests, orthodox or otherwise, enabling us to have a highly customized wedding (custom menu, under-the-sea-themed cake, tropical flower arrangements, rain lighting, bamboo flower canopy, PowerPoint projected on a side of a wall, traditional Thai dance in front of the waterfall, etc.). 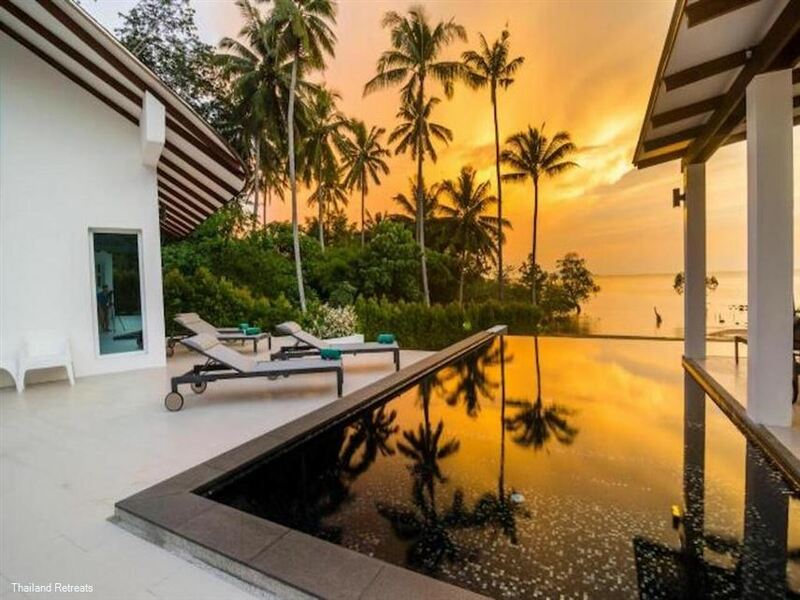 The day of the wedding, the team worked hard to transform the villa into the vision of a tropical paradise. They combed the beach for driftwood and put flower petals in the pools. I was relieved when I saw they had gone ahead and taken care of some last minute details I had forgotten to address (hiring massage therapists and procuring flowers for tropical cocktails). Krabi Riviera picked up all our guest at their hotels and brought them to the venue, which is so secluded that it is difficult to find. The evening flowed smoothly, from the ceremony to cocktails, to fire dancers and fireworks exploding overhead. It was a beautiful night. 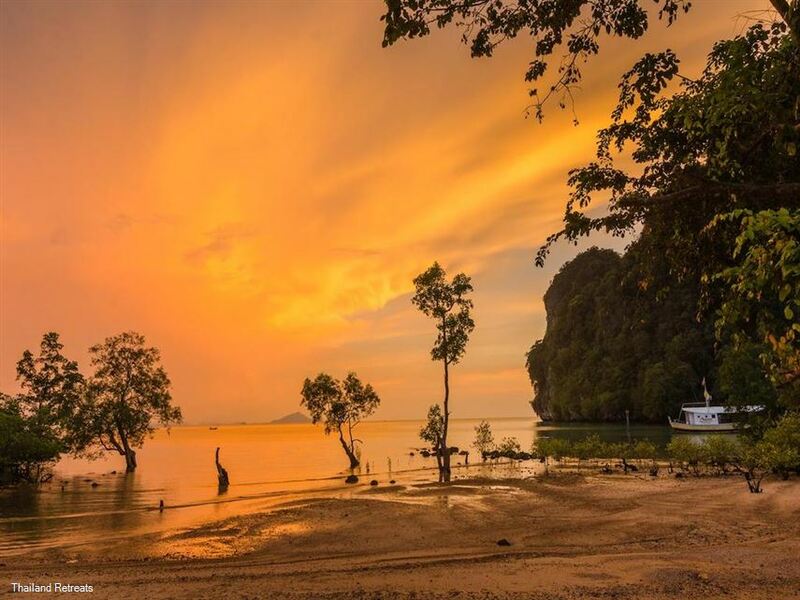 You could not ask for better service and execution than what we got with Krabi Riviera. We cannot thank the team enough for making our dream wedding come true. We had a wonderful stay at The Beach House finding it difficult to raise the enthusiasm to leave the place to see more of the local area. We enjoyed great weather throughout our 8 day stay and everything we needed and wanted were available at the villa. If anything the pictures do not do the place justice it is difficult to describe the fantastic view from your bed as you wake to sunrise. Ching was great as villa manager and had a capable team behind her to resolve any issues whatsoever that arose! It was also good to have our driver Pong available just by a call on the mobile to take us where we wished. We have stayed in some fabulous places in the last few years but this is now going to be very difficult to beat! Thanks Ton and your team you have developed a lovely holiday venue.